We've been Making Flags and Banners for nearly 50 years! And now we're the Biggest Kite Store in the Greater Portland Area. 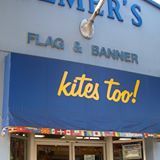 Shop Elmer's Flag & Banner. Experience the Wall of Flags, huge selection of house flags and windsocks, weathervanes, flagpoles, flags, and wind toys. Kites, Too! We've been Making Flags and Banners for nearly 50 years! And now we're the Biggest Kite Store in the Greater Portland Area. Shop Elmer's Flag & Banner. Experience the Wall of Flags, huge selection of house flags and windsocks, weathervanes, flagpoles, flags, and wind toys. Kites, Too!